Redlands Mayor PAUL FOSTER provided a most interesting presentation on redistricting, including historical background and various potential maps of what our voting districts might look like in the future. The California Voters Act is forcing public agencies into this model of representation, where the choice is transition or lose in costly litigation. While there are plenty of obstacles in this system, it is our new reality and one that we all will adjust to beginning the election cycle in 2018. Sadly there was not a lot of time left for the Mayor to talk about some of the good things going on in our community. Possibly we can have him back as those events unfold. Former journalist CASSY MCDUFF will be providing us information on Ontario International Airport. No longer under the direction of Los Angeles International, Ontario has the ability to grow, increase routes, and become a top regional airport. To get us in the holiday spirit, our own WAYNE SCOTT will provide a holiday story along with caroling. Bring your proper holiday attitude and best caroling voice to make this an enjoyable afternoon. 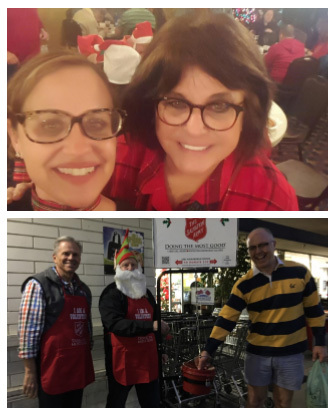 HOLIDAY MUSINGS With Purple Turtles and the Salvation Army collection behind us, we do have another opportunity for Rotarian’s to participate in holiday activities. For many years our club has participated in the Rose Parade Rotary Float building. Once again this year, 20 lucky people can participate on Wednesday, December 28 from 4-11 PM. This is a family friendly event, so spouses and kids are welcome to participate. See coordinator RAY WATTS for more details. In the Voice of an Angel category, we have had at least one Rotarian and UofR member participate in the Feast of Lights. Back in the late 1970’s a young new professor performed six years in the program. Hey, CHRIS WALKER, can you serenade us again? On behalf of Children’s Fund, special thanks to BILL HATFIELD and his daughters for filling up a truck on the showroom floor with toys for the kids Children’s Fund serves. Thanks as well to the other Rotarians who added to the load. You may notice on the back of this Spoke, under Rotary Avenue of Service Chairs, for Red Wine and Blues, it list “The Club”. That would mean all of us. SANDY BENTLEY, LYNN WHITMERE, and other key organizers have already begun lining folks up to make this, once again, a successful event. If you’re in The Club, you’re on the team. Thank you to ELF JEFF FRAZIER and his fellow Rotarians that participated in the Bell Ringing challenge this year. On Saturday, December 10, 2016 The Rotary Club of Redlands raised $374.66 in 7 hours!!! Well done and thank you in making someone’s holiday just a little bit nicer! Lastly, I’d like to thank Past President Pinder for stepping in for me this week while Marvin and I are out of State visiting family on a pre-holiday visit. Please take pictures of PPP in his Robin hood hat for me, just be glad he left his tights at home!